These nutritious coconut and raspberry flapjacks are utterly divine! 7 ingredients, easy to make and will sure bring a smile to anyones face. Perfect as an afternoon treat, for a grab & go breakfast or as a light dessert. Vegan, GF & healthy. Preheat the oven to 160ºc fan/180ºc/360ºf and line a 9x9 inch cake pan or baking dish. Place the honey/maple syrup and coconut oil into a medium saucepan and stir together over a low heat until melted. Remove the pan from the heat and add the oats, ground almonds, desiccated coconut and salt. Mix throughly so that everything is combined and evenly coated. Pour 2/3rds of the oat mixture into the lined baking dish and use the bottom of a glass to push down and compact the mixture into one even layer. Bake in the preheated oven for 5 minutes before removing. Meanwhile, add the frozen raspberries to a small saucepan over a medium heat. Use a fork to mash the raspberries into a puree as they begin to thaw. Bring the puree to a bubble then remove from the heat. Taste and add the honey/maple syrup if so desired. Pour the raspberry puree over the top of the part-baked oats and spread it out evenly. Gently add the remaining oat mixture to the top and return to the oven for 15-17 minutes until golden brown. Allow the flapjacks to cool completely before removing from the baking dish and cutting into 8 rectangles to serve. These flapjacks will keep well in an airtight container for up to 3 days. 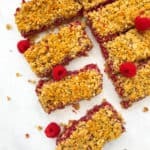 For a variation on these coconut raspberry flapjacks why not try using the same amount of frozen blueberries, strawberries or blackberries. Gluten Free: Assure that your oats are certified gluten free. I like the flavour that coconut oil brings in this recipe but you could also use a good quality butter. If you are in the U.S. you may better know 'ground almonds' as almond meal or almond flour. Always check the ingredients of your desiccated coconut to assure it has not been unnecessarily sweetened.